In many regions where outward opening windows are popular thanks to their tight seal, high wind loads are a key factor in designing windows. 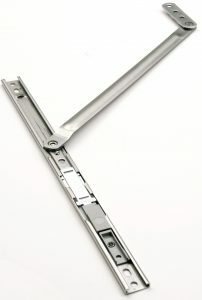 The high-quality “Roto FS Kempton” 4-bar hinges ensure that window sashes can be opened outwards in a controlled and safe manner, even in strong winds. Roto has added a useful accessory to the range in the form of a new retainer for Top-Hung windows, i.e. outward opening hinged windows. The retainer is available in three different sizes so that it can be ideally combined with select series of Roto 4-bar hinges of various sizes. The Roto retainer can be used on the left and right and must be fitted to the sash in pairs. Sashes up to a maximum size of 900 mm x 2500 mm can be equipped with the retainer. The new retainer is manufactured from austenitic stainless steel in the same way as the 4-bar hinges from the “Roto FS Kempton” range. This makes it highly resistant to corrosion and ideal for use near the coast or in heavily industrialized regions. and more than 40 subsidiaries worldwide.